A winter warmer for a crowd. Farm fresh apple cider and rum go together like peanut butter & jelly. 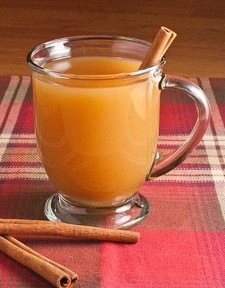 Follow our recipe for mulled cider or feel free to use your favorite recipe. You can keep this warm on the stovetop or in a crockpot. Once you add the rum be sure to keep the heat as low as possible. Add all of the ingredients except the rum to a sauce pot. Gently heat to a low low simmer for 10 to 15 minutes depending on your desire for strong spice flavors. Remove the pot from the heat and strain out the orange slices and whole spices. Add the rum and serve immediately or keep on low heat.